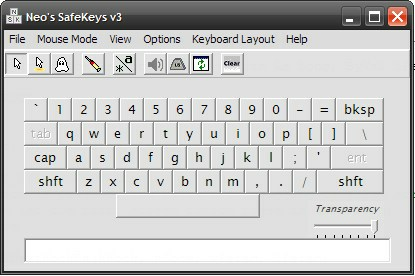 Great Keylogger protection – the keyboard not used in the creation or transfer of your passwords…ever. Please note that the ‘standard’ drag-drop mechanism is the safest – we suggest you only use the injection mode only if your target program requires it. Note on Screenlogger protection. Neo’s SafeKeys once had great protection against screenloggers. In the arms race of security software against keylogger protection, they are currently one step ahead with screen logging. Neo’s SafeKeys no longer provides protection against screenloggers. Click here to read more about the features of Neo’s SafeKeys v3.